We again need To THANK - The Fortunato DiNatale Family of their Hoboken Ristorante TUTTA PASTA and 200 Lounge NightClub for hosting our our 90+ year long annual celebration Sinatra Swing Dance and Birthday Bash, over the past SIX years. All the attendees praise your encouragement of the Children Bambini at our celebration to share their Sinatra and Holiday songs. After all, That's how Frank Started Right here in Hoboken back before 1920. To See the Bambini dancing, singing and swing Sinatra songs will keep our Sinatra celebrations Eternal. We All in Hoboken, love your Family and Miss You. We pray you enjoy the greatest Retirement. For your great contributions, We'll always be thinking about your Family all during the Christmas Holiday season. Here In Hoboken, , Frank's Hometown Birthplace City, It's a Month long celebration (for SANDY 2012 ) - We Raise a Glass to him and his Family. We are so grateful for his extraordinary contributions to the Arts, Music, our Lives and Italian Heritage. A Hoboken local KID from our LIttle Italy Piccolo Italia neighborhood that grew up to be Called - THE VOICE. We're are very Proud that Mr Frank Sinatra is / was the USA's First American IDOL and grew to become - The International Entertainment ICON. So for us, this is a Familly and Friends celebration and Sunday Gravy Music Holiday House Party like No Other. - Annually Celebrated Here, This 2012 year for SANDY Relief. Like Frank Sinatra's First Birthday party here, in Hoboken, where his Family started, Our's is the most Humble Sinatra Celebration. Just Great Friends and Family, around Old School Dinner tables of Italian Food andCherished Music singalong celebration. A Down to Earth, heartfelt celebration. 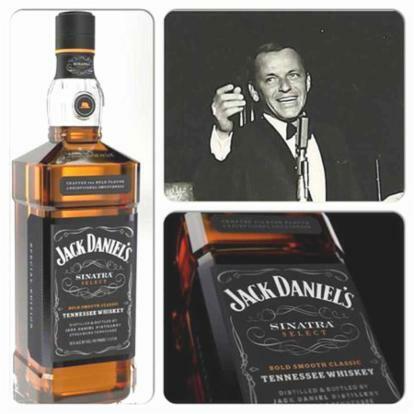 No stages or strings, Friends and Family around Italian Dinner Tables and Pure Sinatra Love. . Here In Hoboken, Everyone has a Sinatra song in their Heart and We sing Homage to his Contribution Everyday. - JOIN US. The current target for charity Support is - The American Red Cross - http://www.redcross.org/ For the Funds we raise - We'd like to see a local area impact. So, We are also considering support for a New local Hoboken Effort to help rebuild - We making efforts to better undertand, who is involved and what entites they are currently a party of or represent - Rebuild Hoboken - . We will find out more and keep you posted on Day of our Event Shopping Boutiques All Along Washington Street are Fully Re-Opened after Hurrican Sandy - Join Us. This Event is a very Intimate Frank Sinatra Singalong Salute of our 97th Annual 2012 Old School Hoboken House Party. JOIN US. Come Raise a Glass to for our SingAlong to Frank Sinatra, where It All First started - Hoboken, to Our Favorite Son, USA's First American IDOL. Here we sing Sinatra Music Every Day. DELAURO is a Musician, Vocalist, Band Leader and singer from Hoboken, NJ Frank Sinatra Hometown and House. This Celebration is Nothing like those huge DeLauro Concerts not at all. It's Back Home Old School Community service celebration. Our, The Original, Frank Sinatra Birthday Bash Party Celebration - IS an OLD SCHOOL HOBOKEN HOUSE PARTY, like Franks very FIRST BIRTHDAY, here in Hoboken, Just Pure Sinatra Love. In the Mid 1910's families in the Hoboken Little Italy house could NOT even afford a Radio or a Phonograph. A Piano in any home was an extraordinary luxury, especially here in Hoboken's Little Italy. This Venue is Extremely Intimate, Just Like the Hoboken Frank Sinatra Family first railroad apartment of just Three small rooms. Here in Hoboken, everyone has a Sinatra song their Hearts and we sing his music Every Single Day. THE AUDIENCE ARE THE SINGERS. it's a House Party Dinner Table - Frank Sinatra Sing-Along Salute. OLD SCHOOL. YOU ARE THE SINGERS, we are keeping a family tradition by celebrating in Hoboken for Frank's 97th Birthday, here Guests are the Entertainment. 2) It's a DELAURO Family Tradition.- DeLauro's Grandparents lived in the same Hoboken House with the Sinatra's for 15 years. They were at baby Frank's very First Birthday party, an intimate modest family meal. 4) It's a Great Holiday Time of Year and a Positive Moment for SANDY Rebuilding support efforts - JOIN US. Just Like Frank's First Birthday House Party in Hoboken, The is very Intimate,just for friends, family, food, love and group singalong, maybe a special guest or two. If you feel the Vino and Love, You can room for a little Dancing. On this afternnoon, There will be NO Band or Orchestra. JOIN US. 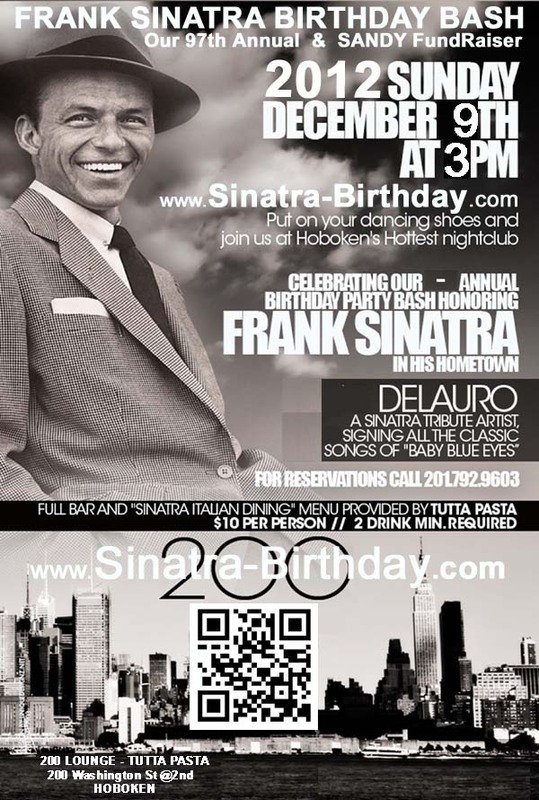 here iin Hoboken, our Super Retro Old School Frank Sinatra Salute Birthday Hoboken House Party, a NY City Metro area hometown City of Hoboken, this Birthday celebration is a Sacred homage and Intimate singalong. 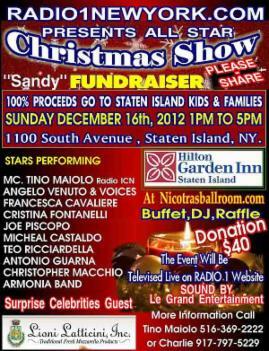 Sunday - Dec 16th- GANG UNFORTUNATELY - WE JUST GOT WORD THAT THIS EFFORT FOR SANDY FUNDRAISING HAS BEEN CANCELLED - THE MUSIC AT THIS EVENT WOULD HAVE BEEN SO SO VERY BEAUTIFUL AND HEALING AT THIS DIFFICULT TME. I APPLAUD`E THE FELLOW MUSICIANS FOR OFFERING TO ALL DONATE THEIR SERVICES. SANDY HAS BEEN SO TOUGH FOR OUR ENTIRE COMMUNITY - WE ARE ALL TRYING OT FIND WAYS TO HELP, PITCH IN AND DO OUR PART FOR THOSE SUFFERING .